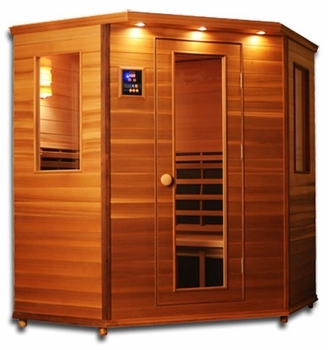 Four person cedar infrared sauna comes with dual digital controllers and mood lighting. Carbon fiber heaters are also included.Our four person corner saunas are one of the most popular models and made from highest quality western red Canadian cedar wood and advanced heater made from combination of carbon and ceramic elements. This sauna can accommodate up-to four persons easily. Made from high quality western red Canadian cedar wood. Double wall tongue and groove construction with no veneers. AM/FM/CD player with dual digital controllers. Two windows for light and ventilation. Halogen accent light for mood and reading. Enhanced interior wooden light shade and beautiful exterior light.